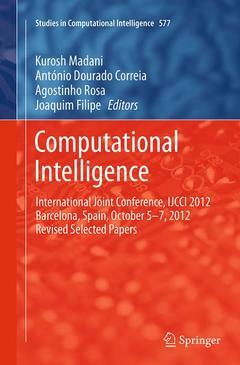 The present book includes extended and revised versions of a set of selected papers from the Fourth International Joint Conference on Computational Intelligence (IJCCI 2012), held in Barcelona, Spain, from 5 to 7 October, 2012. The conference was sponsored by the Institute for Systems and Technologies of Information, Control and Communication (INSTICC) and was organized in cooperation with the Association for the Advancement of Artificial Intelligence (AAAI). The conference brought together researchers, engineers and practitioners in computational technologies, especially those related to the areas of fuzzy computation, evolutionary computation and neural computation. It is composed of three co-located conferences, each one specialized in one of the aforementioned knowledge areas. Namely: International Conference on Evolutionary Computation Theory and Applications (ECTA) - International Conference on Fuzzy Computation Theory and Applications (FCTA) - International Conference on Neural Computation Theory and Applications (NCTA). Recent progresses in scientific developments and applications in these three areas are reported in this book This book includes revised and extended versions of a strict selection of the best papers presented at the conference. Memory Storage.- Optimized Test Case Generation Based on Operational Profiles with Fault-Proneness Information. Design Pattern for Self-adaptive RTE Systems monitoring.- Changing the Software Engineering Education: A Report from Current Situation in Mexico.- Does A Code Review Tool Evolve As the DeveloperIntended? - Analysis of Mouth Shape Deformation Rate for Generation of Japanese Utterance Images Automatically. Environment.- Expression Strength for the Emotional Scene Detection from Lifelog Videos.- A Procedure for the Development of Mobile Applications Software.- The Relationships between Conversation Skill and Feeling of Load on Youth in Communicate with Elderly Persons using Video Image and Photographs. the Features of Plug-and-Feather Holes.- A Route Recommender System based on the User’s Visit Duration at Sightseeing Locations. Predicting Access to Healthcare Using Data Mining Techniques.- Object Tracking Method Using PTAMM and Estimated Foreground Regions.- Application of Detecting Blinks for Communication Support Tool.